A short time ago I found MSMQ. To say it easy: MSMQ is a system where messages are able to be classified into queues and be converted piece by piece. MSMQ is a system of queues. You put your message into it and than somebody will take it and convert it. This could be very useful in distributed applications for example. So for example it is possible to generate E-Mails, put them in a queue and send them out piece by piece so the server won´t be overloaded. Of course there are a lot more possibilities but this is just an introduction. Later I´m going to talk about some more advantages and disadvantages and I would be very glad to get some comments from you. 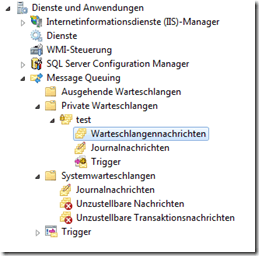 For my demo code it is necessary to create the “test” queue beneath the private queues. Easy, isn´t it? If you click on “receive” the first message of the queue will be chosen. Afterwards the message won´t be reachable for other clients as well. Of course it is possible to send extensive file types as well. 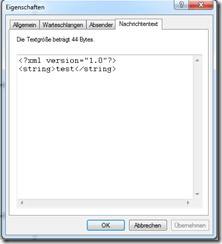 These file types will be written into the message by the XmlSerializer. It works. And now? WHY should I use MSMQ? You are right. It is possible to make this whole queue thing with SQL ore other self made applications. So why should you take a look on MSMQ? Each queue can only be 2GB. Each message 4MB (altough the 4MB limit can be fixed by using MSMQ with WCF). Only for Windows so you´re limited to use it with .NET, C/C++ or COM library for COM-enabled environments. Supports Windows Network Load Balancer. 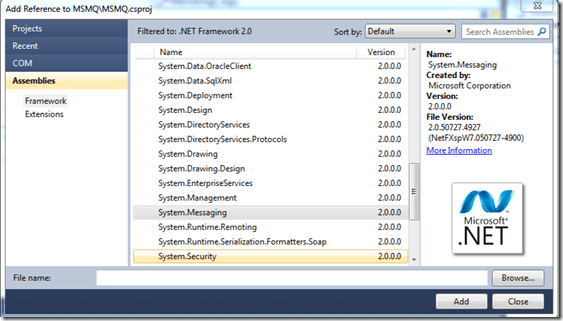 MSMQ messages can be tracked by audit messages in the Windows Event log. Messages can be automatically authenticated (signed) or encrypted upon sending, and verified and decrypted upon reception. Do you use MSMQ already? Ore do you prefer a simple SQL data base? Of course the pros sound nice but isn´t this possible with SQL as well? Are you having any more extensive examples?